Workflow approvals without EDIT emails to all in the workflow. 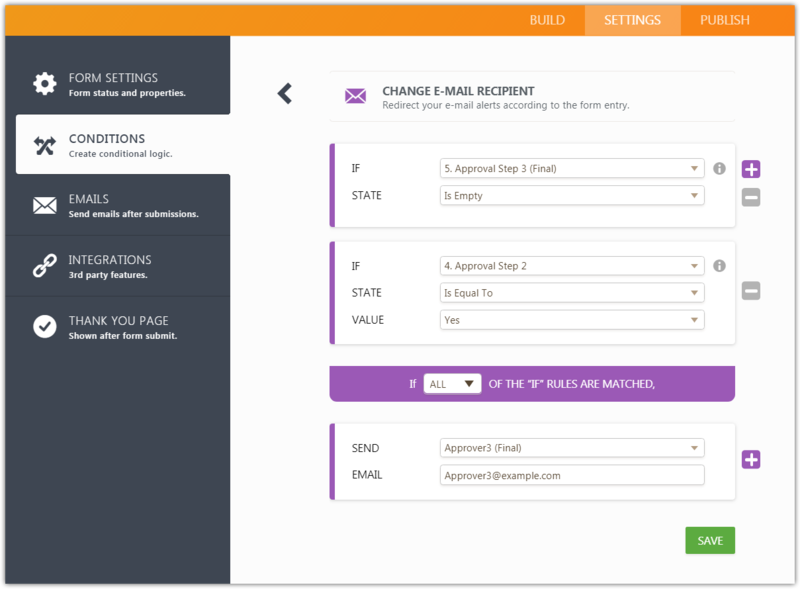 I have created a form with conditions and set up individual notifications and autoresponders. The question: How do I create a workflow that moves from Applicant, to Assistant Principal, to Daily Organiser, to Deputy without sending EDIT emails each time the form is moved to the next approver? At the present time the workflow is happening, however each of the staff inthe workflow receive an edit as the form moves through the workflow. i thought removing 'send on edit' and creating prescribed conditions would work? I cloned your form and I did test submissions. I can verify that the 5th, 10th and 12th condition are working properly. 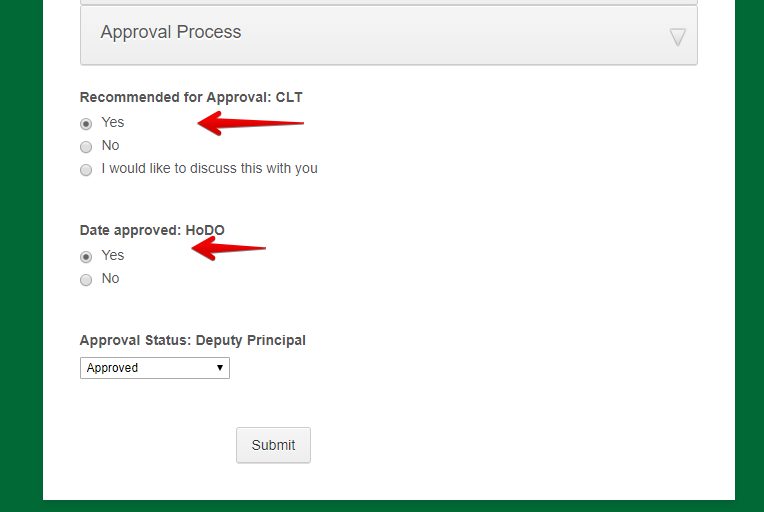 After submitting the form and selecting "Leadership Development", the "Date Check: HoDo" email alert will be triggered. The "Send on Edit" option in these associated email alerts is enabled. If you disable the "Send on Edit" option, the email alert will not be sent. 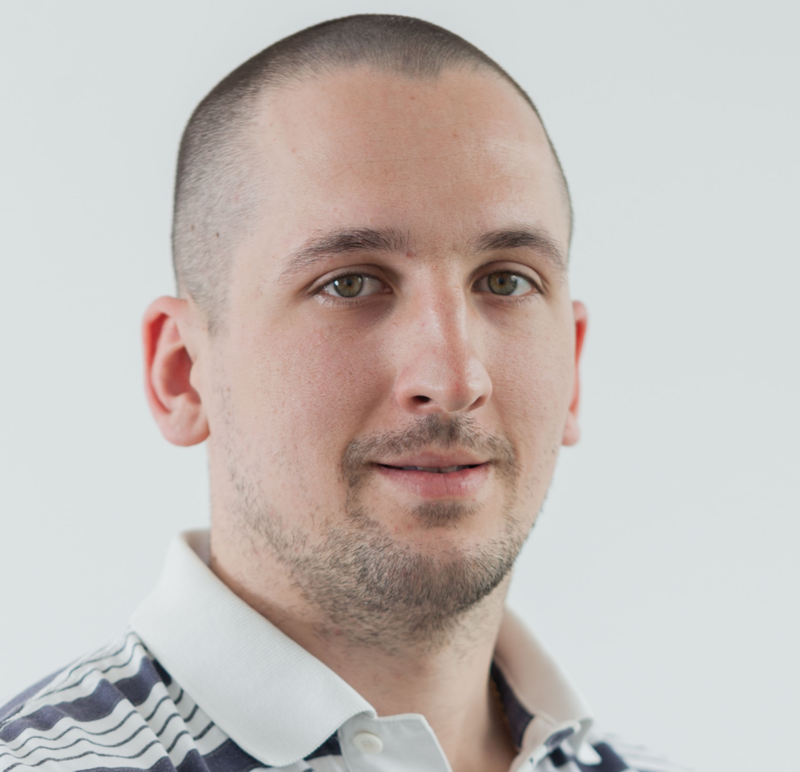 Can you please provide more details about the workflow where you encounter the issue? In this way, we can try to replicate it. I want to control the workflow rather than 'send on edit' which sends an email to everyone in the workflow. Is this possible? How do i achieve this? If i remove the 'send on edit' will the workflow default to the condition i have set? I am taking a look at your form and coming up with the conditions. Give me a moment and I'll get back to you. 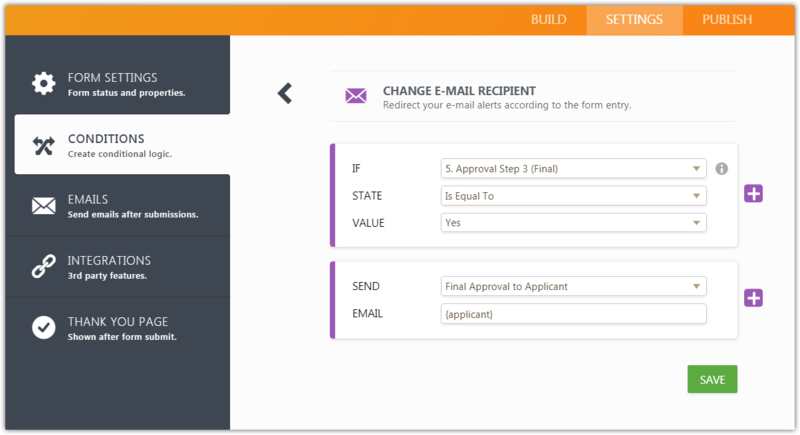 Have you been able to identify a way to make this work without sending edited forms to every email in the workflow? Then you could disable send on edit option so notifications will be sent only when your conditions are true and the form is in edit mode. Please try and let us know how it worked. Thanks for the tip - This is the condition I created: It didn't work. No emails were received after this condition was created. Could it be possible that jotform doesn't allow for a sequential workflow without using 'send on edit'? Why don't the conditions work without 'send on edit' functionality? Ok, I'm sorry for misinforming. Send on edit should be On. 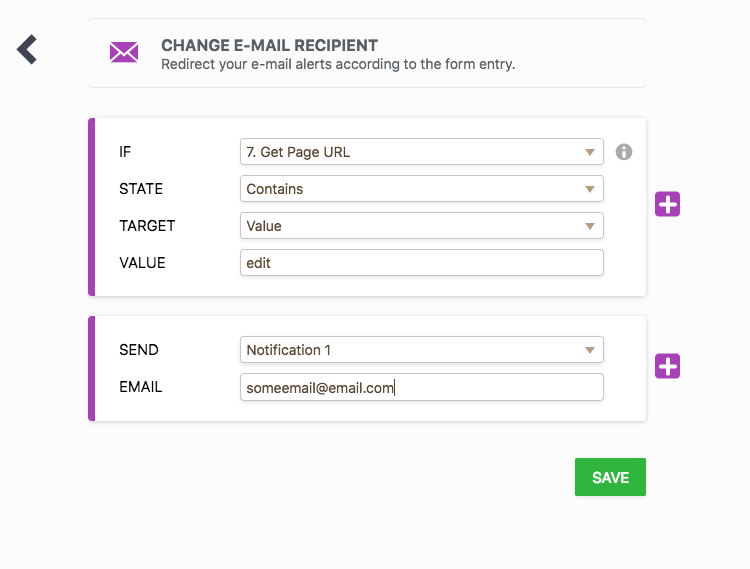 But the condition should handle if the edit email will go to all emails or not, so when condition with get form page url is included plus the selecting of radio button, email should go to one email address only (the one that is set in that particular condition). Now, if you have multiple emails tied to the same radio button choice, the above will not work and I'm afraid that I don't see a way around it. So if you have different radio buttons (where you approve or disapprove) for each email notification, that will work fine, I just tested that. 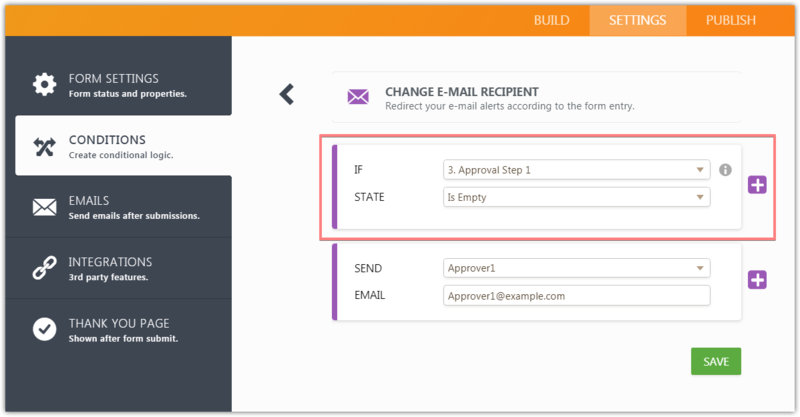 If send on edit is not enabled, notifications will not be sent when a submission is edited so, to avoid sending to all email recipients, you have to implement conditional logic separately for each email notification. This hasn't worked - I cloned the form to make it simpler to review and it didn't work. I keep getting the Edit emails pushed back to all the prior approvers. This can mean 5 EDIT emails. Can you have a look at the form (cloned Staff PD Application) and let me know where I have made a mistake. I am afraid that the Get Page URL widget will not help. You will need to reconsider your email conditions. 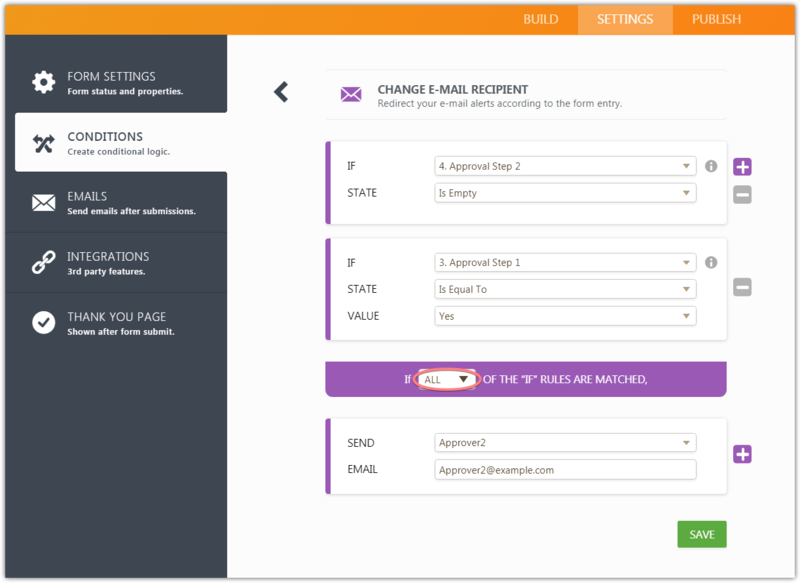 For example, add some extra rules to your conditions, and/or additional email conditions. 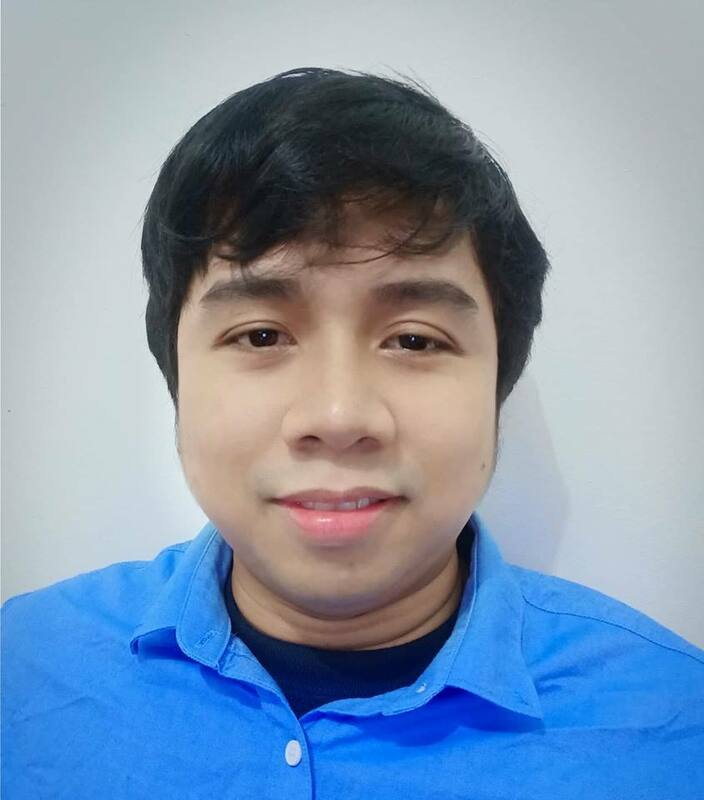 - Send autoresponder to the Applicant ('send on edit' disabled - email sent once). - Send notification to Approver1 ('send on edit' - must be enabled). 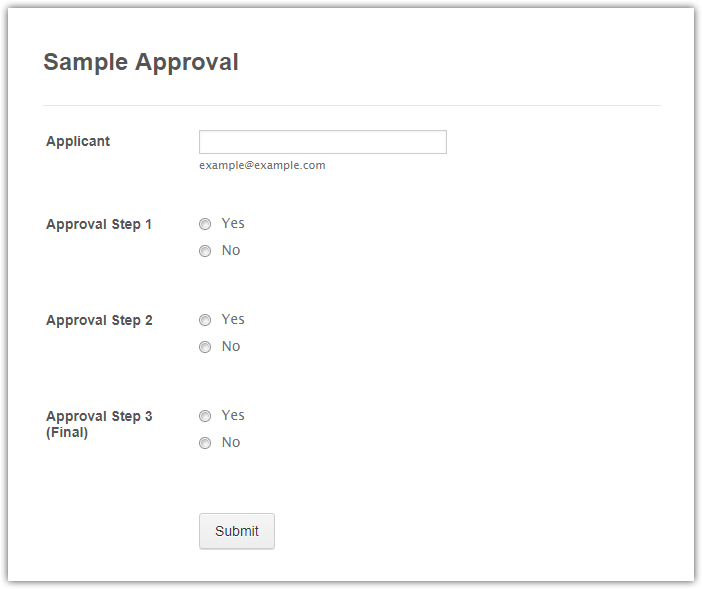 In order to email it only once, add a rule (if 'Approval Step 1' Is Empty, send the email). - Send notification to Approver2 ('send on edit' - must be enabled). - Send notification to Approver3 ('send on edit' - must be enabled). - Send final approval to Applicant ('send on edit' - must be enabled). If your approval process is not linear, you will need more complex conditions setup. YES! This worked. Thank you for the workaround. Much appreciated. This has worked very well until... my latest from: Excursion application. 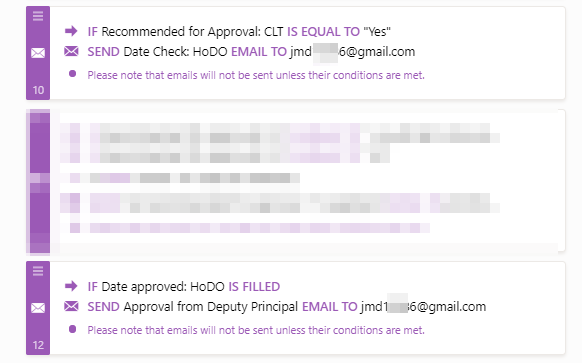 It is sending multiple Edit emails to the first approver (HoDO email address). I have multiple conditions as suggested but for some reason the Edit emails are still coming. Can you identify why this is happening?